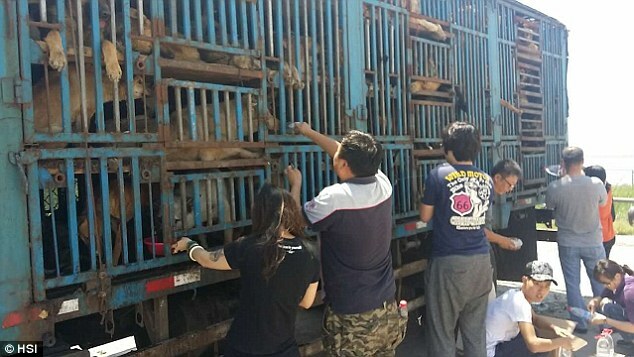 Chinese activists rescue 200 dogs from the exceptionally-brutal Asian dog meat trade weeks before the 2016 Yulin Dog Meat Festival. They stayed three days until the dogs were negotiated for release, though sadly 20 dogs were already found dead inside. NOTE: 2016 UPDATES from last year's post. The Barbaric Yulin Dog Meat Festival is scheduled in China once again this June despite worldwide outrage, loud global social media coverage and despite 100,000 Chinese citizens and their furry friends protesting the event inside China. Because of the sustained pressure, the number of dogs killed for the dog-eating event has dropped approximately 80% according to Animals Asia (a group working to end the festival and the broader dog and cat meat trade in Asia) and that means the number of dogs murdered in the most gruesome ways possible has dropped from 10,000 to 2,000 which is still 2,000 too many. The information below on Yulin's festival still holds and today there is even more relevant information on the topic. It's literally all over the internet. Please join your voice in opposition to this event; especially as it nears. Last year Huffington Post reader's helped spur an anti-Yulin Festival petition sponsored by the non-profit Duo Duo Animal Welfare Project that has recently reached 2 million US signatures - the largest in Change.org's history - along with another Canadian-based one with 5 millions names. These kinds of huge numbers make news and officials do learn about them. 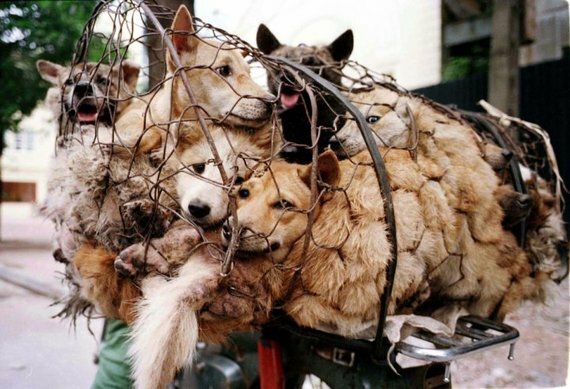 The organizers of the Yulin Dog Meat Festival -- and all animal abusers in all countries, including here in the United States - can run, but in the newly connected world order, they can no longer hide. The world is full of cruel, barbaric acts and images -- what with ISIS beheading people on video and human traffickers said to sell more people into slavery than in the 19th century. Some of this we can do little about as one single person, despite our hope to the contrary. Yet, one inhumane tradition happens each summer in southern China that can be stopped -- and must be stopped -- with voices from you and I. It is as simple as 1+1+1 = the tsunamia of social media. 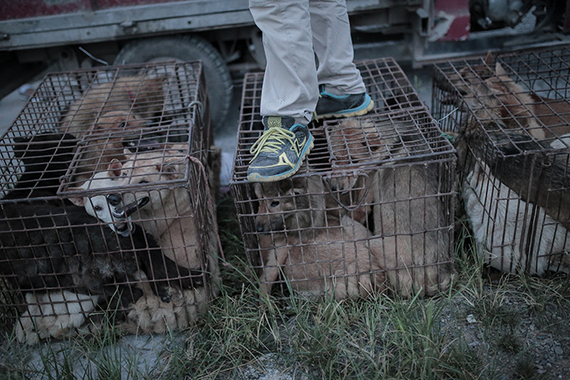 Each June 21, the Yulin Dog Meat Festival takes place in Guangxi province. It is real, despite local government protests to the contrary. 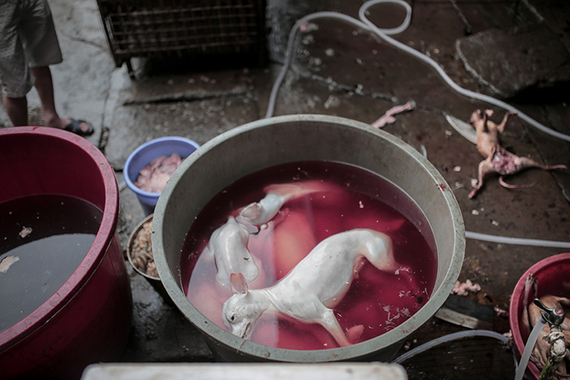 In it, the meat from thousands of dogs and cats are consumed. These nearly 10,000 sentient animals arrive to Yulin in appalling conditions -- often stuffed into cages and dragged on poles -- and the manner in which they're killed, skinned and eaten is horrific, with many clubbed, burned, electrocuted and some skinned alive, according to local activist reports. It is simply torture. The people of Yulin have celebrated the Summer Solstice with this festival since the 1990's, and use the dog and cat meat to eat with lychees and drink grain alcohol. They do not consider any of the above conditions an issue, not even the way the animals arrive or are killed, cooked and consumed. Animal rights groups and activitists for years have been trying to stop the festivities. Yet, despite huge social media protest inside China, it's scheduled to happened again this June. Just recently, Twitter globally alit with the horrifying images of the event with hopes to shame and put pressure on local authorities to stop the festival. Learn what you can about this event. CNN has done some good reporting on it. Other media outlets have, as well. Keep up the pressure! Western consumers of Chinese products and Chinese tourism have a good deal of power. Let us use it. TIME reports it well: TIME. Sign the petition demanding the festival be stopped here. Here's the non-profit -- the Duo Duo Animal Welfare Project - working tirelessly to stop the festival here. A Facebook group working to stop the event. Frequently asked questions about the festival here.